Financially supporting St. Thomas Aquinas demonstrates your belief in the value of a Catholic education, and serves as an affirmation of the good work happening every day in and out of the classroom. By supporting STA, you help advance our mission to develop young men and women into tomorrow's leaders. Many of our programs would not be possible without the contributions of donors like you. As we develop new, life-changing and formational experiences for our students, we will need to devote additional funding to tuition assistance, training, materials, and technology that support them. Whether you contribute to The Annual Fund, endow a scholarship, commit to a campus naming opportunity or participate in the STA Auction, your generosity will make a lasting impact on each and student that calls STA home. 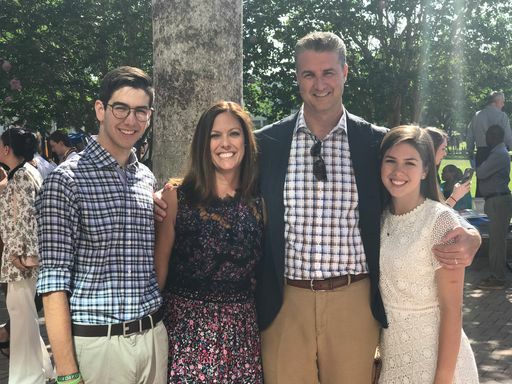 Erik and Denise have been members of the STA Family since 2012 when their son Austin '16 began as a Freshmen. Their daughter, Alyssa is a current Junior. As soon as they began at STA, they got involved. Denise chaired the Aquinas Affair for four years, and is on the Foundation's Board of Directors. "For Erik and I it was important to get involved at St. Thomas Aquinas. We were very involved in their elementary school, and felt it was important to do the same at the high school level. We not only support the school financially, but also with our time. It is through volunteering with different STA events, that I have learned more about the school, connected with fellow STA families, and truly saw firsthand what the STA tradition of excellence is all about. There is no place like STA!" Provide professional development opportunities and incentives to STA's greatest asset, our faculty. Provide need-based financial assistance to deserving and qualified students. Ensure that STA is able to provide the facilities and opportunities necessary for students to succeed now and at the next level. Support where the need is high, and allow St. Thomas Aquinas the flexibility to address the school's most important funding need. We graciously thank all those who contribute to our Annual Fund! Your generosity and compassion does not go unnoticed.